Most anything that makes its way through a secret passage is worth taking note of, especially when it's Colonel Mustard and he's carrying a candlestick that's bloody as hell. 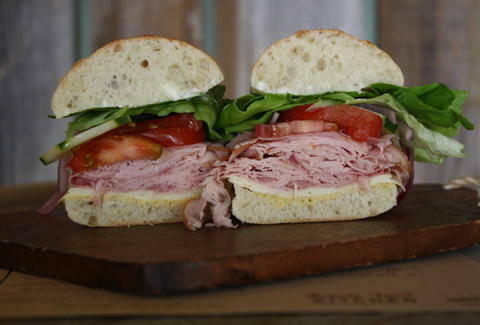 Building your next sandwich with secret passage-procured fixings, Back Yard Kitchen, opening this weekend. The latest from the dudes behind The Brick Yard, BYK is an around-the-corner sandwich shop with a 300sqft salvaged-redwood interior that actually connects to Brick Yard's kitchen through a small tiled window in the back that they painstakingly tunneled through a shared wall, while Nightcrawler just sat there laughing. BAMF!!! The menu features nine sandwiching options named after playground staples (Tether Ball, Slip & Slide, Sand Box Club), seven of which'll be served hot including the the Chicken Sink (grilled chicken, mozz, artichoke hearts, caramelized onions, roasted red peppers, tomato relish) and the Back Yard Bully, which's got braised lamb shank, cherry marmalade, brie, red wine vinaigrette, garlic aioli, and a tendency to push you at the exact moment someone kneels behind you. There're also a pair of cold sandos, including a turkey club updated with chipotle aioli, plus a build-your-own hookup, and five salads including the pear, hazelnut, and goat cheese-topped Putting Green, which they only picked because it's nearly impossible to fit a clown with a huge tongue and a windmill into a salad. And starting next Monday, they'll also be doing beach-cruiser sandwich deliveries on Union St as long as you make a minimum order, and have some sort of Clue what you're getting. Though maybe avoid that Mustard, dude can NOT be trusted.